Jason Jamaal Alford (born May 28, 1983) is an American football defensive tackle who is currently a free agent. He most recently played for the Saskatchewan Roughriders. He was drafted by the New York Giants in the third round of the 2007 NFL Draft. He played college football at Penn State. Alford has also been a member of the Oakland Raiders and Seattle Seahawks. In 2007, Alford served as the Giant's long snapper during field goal attempts, due to a season-ending injury to Ryan Kuehl. Alford won Super Bowl XLII in his first season, sacking Tom Brady in the final minute of the Giants' 17-14 win over the New England Patriots. Alford Attended Orange High School, (N.J.) about 30 minutes from Giants Stadium. He was a three-year starter who was selected First-team All-State, U.S. Army All-American and was listed among the G&W Recruiting Report Top 50 defensive players in the nation. 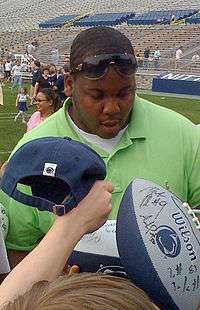 Alford was a four-year starter for the Nittany Lions. He played in 46 games with 41 starts for the Nittany Lions and recorded 118 tackles (60 solo), 32 tackles for losses and 19 sacks. He also recovered 4 fumbles, forced 3 fumbles, deflected 12 passes and registered 3 quarterback pressures. He was named Third-team All-America selection by the Associated Press and was All-Big Ten selection as a junior and senior. Alford finished his senior season with 32 tackles and eight sacks. Alford earned a Bachelor of Arts in Integrative Arts from Penn State in 2006. He was selected for Penn State's Jim O’Hora Award which honors the defense’s most improved player each season. Alford signed with the Virginia Destroyers of the UFL. It was the Destroyers' inaugural season in the UFL, and Alford helped lead them to a victory in the 2011 UFL Championship Game over the two-time defending champion Las Vegas Locos. The win gives Alford a championship in both the NFL and UFL, ironically in his first season in both leagues. ↑ "Strahan Decision Forthcoming". Scout.com. 28 August 2007. ↑ "The Official Website of the Chicago Bears". ↑ "position_rankings NFL Draft". Sporting News. ↑ "Virginia Destroyers of UFL give Marty Schottenheimer first pro title". ESPN.com. ↑ "Roughrider Roster Moves". Saskatchewan Roughriders. 17 June 2012. ↑ "Riders sign two". Saskatchewan Roughriders. 7 August 2012. ↑ "Alford Meets the Media". Scout.com. 29 April 2007. ↑ "Giants.com - The Official Website of the New York Giants". ↑ "Orange embraces Alford, its NY Giant". NJ.com.